Birmingham was the only city to submit a bid to host the 2022 Commonwealth Games before Saturday's deadline, the Commonwealth Games Federation says. Kuala Lumpur in Malaysia, Victoria in Canada and a potential Australian entry had been thought to be possible bidders but none came forward. The CGF says it will now review the bid to check it "meets the requirements of successfully hosting" the event. Birmingham beat Liverpool earlier in September as Britain's candidate city. David Grevemberg, chief executive of the Commonwealth Games Federation, said on Saturday: "There have also been continued expressions of interest and support from Canada, Malaysia and Australia." A CGF board meeting is due to take place in Sri Lanka on 5 and 6 October and it says a final decision on the host city "is expected by the end of the year". The cost of staging the event is expected to be at least £750m, which would be the most expensive sports event in Britain since the London 2012 Olympics. Birmingham is now almost certain to be hosting its first global sports event. The Commonwealth Games Federation will go through the motions and assess the finer details, but it is unthinkable that it would reject the only city to actually submit a bid, especially with government backing. Even though the rejection of original choice Durban has meant a fast-tracked process, the absence of any rivals is another reminder of the difficulty global sport bodies now face in attracting host cities, and mounting concern over the costs of such events, along with doubts over legacy. 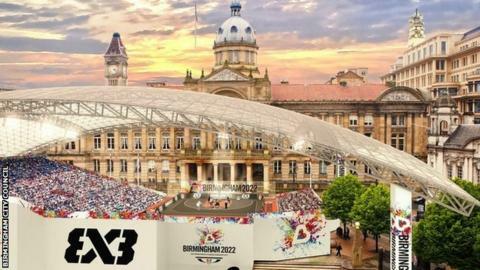 Despite the bitter bin dispute continuing to hang over the Birmingham area, and the need for further budget cuts, local authorities will need to raise 25% of the overall cost of staging the Games. Organisers insist essential services will not be affected, and that the event will prove great value for the West Midlands, showcasing a diverse and youthful community, and leaving a sporting and economic legacy. Others will worry that taxes will rise as a result. But after London 2012, Glasgow 2014, the Tour de France's Grand Depart in Yorkshire and recent world championships in rugby, women's cricket and athletics, Britain is now set to organise yet another major sports event. With hockey, netball and cycling all staging their flagship events in Britain over the next two years, this is another reminder of the importance the government now places on hosting sport as a platform for trade and tourism as the country prepares for Brexit.